In my plant-based, whole foods kitchen I do a lot of cooking. Having plenty of spices on-hand is important in helping create master pieces! At this moment, there are no less than 50+ different spices adorning my spice clips and shelves. Some, I use only occasionally; others, I use constantly. I want to share the top 15 spices and flavorings I use on a regular basis to create amazingly flavorful and healthy dishes. They are listed in no particular order. Here we go! 1. Italian Seasoning is a mixture of oregano, basil, rosemary, thyme, and garlic. I buy it already blended, and it can be purchased at most local grocery stores. It’s used in pasta dishes, lasagna, tomato sauce, spaghetti, and many other dishes. 2. Garlic Powder is a must! It gives dishes a slight garlic flavor without the texture, so disperses well in liquids like salad dressings and sauces. .
3. Onion Powder is another necessity. It can’t replace fresh onions, but it definitely has a prominent place in the kitchen to add flavors to all kinds of dishes and sauces. The long shelf life is another plus if you don’t use fresh onions often enough to merit keeping them on hand. 4. Paprika (and Smoked Paprika) is made from dried fruits of the chili pepper family. My Creamy Vegan Cheese Sauce is one of many recipes where its flavor is irreplaceable. Smoked paprika is one of my absolute favorites! 5. Peppercorn Mélange is a colorful blend of whole black, white, green, and pink peppercorns. I love to add it to tofu scramble, hash browns, baked potatoes, and many other dishes. 6. Turmeric is from the ginger family and has its origins in India. Its color is orange-yellow, and dishes that it’s used in will take on the coloring. When used in tofu scramble, it gives the appearance of the yellow coloring of eggs. 7. Tarragon has a unique flavor that easily dominates other flavors, if used too heavily. It pairs well with artichokes, carrots, mushrooms, onions, potatoes, salads, and spinach. I add it to many dishes, including my homemade veggie broth. 8. Cayenne Pepper is my favorite go-to for adding a little kick to my family’s favorite recipes. It’s another one that goes into sauces, dips, and so much more. It also has many health benefits. 10. Cumin is native from the east Mediterranean to India. It adds an earthy warm feeling to many soups and stews. It also has many medicinal purposes. 11. Steak Seasoning is one I bet you weren’t thinking you’d hear on a plant-based blog. It is made from grinding black pepper, paprika, kosher salt, granulated garlic, dill seed, coriander seed, and red pepper flakes. I purchase it already blended at my local grocery store, and add it to tomato sandwiches, baked potatoes, hash browns, steamed veggies, rice, and almost any dish to give that extra punch of flavor. 12. Bay Leaf is one of my favorites for homemade veggie broth, soups, stews, and a crock pot full of beans. 13. 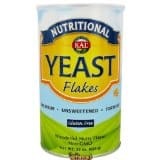 Nutritional Yeast is a seasoning I wouldn’t want to be without! It adds a nutty, cheesy flavor to pastas, sauces, dips, baked potatoes, and many other dishes. My favorite brand is Kal, and I use it so much that I buy in bulk to save money. The link to amazon is here. If you do much plant-based cooking, I’m betting you’ll find yourself using a lot too. Click picture for amazon link to this product. Affiliate link. 14. Pure Vanilla is more accurately called a flavoring than a spice, but I wanted to make sure to include it in this list. My favorite brand is McCormick’s because it comes in large bottles, saves me money, and the flavor is excellent. I use this in many desserts like Chocolate Mousse, Pumpkin Walnut Raisin Cookies, and Chocolate Banana Smoothies. 15. Sauces that I consider necessities are: Bragg’s Amino Acids, soy sauce, tamari, and Worcestershire sauce. These all add a distinct and robust flavor to many recipes. When purchasing Worcestershire sauce, make sure to read the label and choose one without anchovies. It doesn’t have to be expensive and say VEGAN on it. My experience has been that some of the no-name, cheaper brands are anchovy-free. Creating new, healthy recipes with all my spices is like science and art brought together. Science, because of nutrition—using the power of foods to promote healing within the body. And art, because of beauty and uniqueness—capturing the visual appeal. Not to mention, it has to taste amazing. Having a full spice rack helps me do that! NOTE: I also use coarse sea salt with iodine in most of my dishes. The excess sodium that most Americans consume comes from processed foods, not a salt shaker. When switching to a plant-based, whole foods way of life, sodium is not usually an issue in my experience. Clips installed on cabinet door. Click to view on amazon. Affiliate link. I love my spice travel kit. 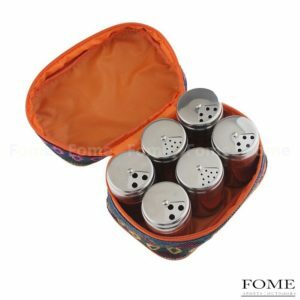 6 Pcs Spice Bottles Spice Slat Pepper Herb Container Shakers with Portable Pouch for Outdoor, Home, Camping, BBQ . Click to view on amazon. Affiliate link. Top 15 favorite herbs & spices. I have most of those except tarragon which I keep forgetting to pick up and the steak seasoning. I never thought of that. I love my pink RealSalt; I think it’s healthy although I still get some water retention from using it. Thanks for your list. I buy vegan worcestershire because I didn’t realize other kinds might not have anchovy. Could you tell me what the clips are called so I can find some? That is a wonderful idea. Sorry. Just saw the link at the beginning of the post for the links. Thanks. Cindi, no problem! The clips are such handy little things and keep my spices within an easy reach. They’re so inexpensive with 12 at around $8. I love mine! Two that I can’t live without are Curry and Sriracha! Curry is well known, and Sriracha is a sauce made mostly from chili peppers. Great information! I have most of them but some of the uses are helpful. In my plant-based, whole foods kitchen I do a lot of cooking. Having plenty of spices on-hand is important in helping create master pieces! At this moment, there are no less than 50+ different spices adorning my spice clips and shelves. Some, I use only occasionally; others, I use constantly.I want to share the top 15 spices and flavorings I use on a regular basis to create amazingly flavorful and healthy dishes. They are listed in no particular order. Here we go! 9. Chili Powder is the dried, pulverized fruit of the chili pepper. This is a very important spice added to my Three Bean Bulgur Chili and Brand New Vegan’s oven fried potatoes. 11. Steak Seasoning is one I bet you weren’t thinking you’d hear on a plant-based blog. It is made from grinding black pepper, paprika, kosher salt, granulated garlic, dill seed, coriander seed, and red pepper flakes. I purchase it already blended at my local grocery store, and add it to tomato sandwiches, baked potatoes, hash browns, steamed veggies, rice, and almost any dish to give that extra punch of flavor. 13. Nutritional Yeast is a seasoning I wouldn’t want to be without! It adds a nutty, cheesy flavor to pastas, sauces, dips, baked potatoes, and many other dishes. My favorite brand is Kal, and I use it so much that I buy in bulk to save money. 14. Pure Vanilla is more accurately called a flavoring than a spice, but I wanted to make sure to include it in this list. My favorite brand is McCormick’s because it comes in large bottles, saves me money, and the flavor is excellent. I use this in many desserts like Chocolate Mousse, Pumpkin Walnut Raisin Cookies, and Chocolate Banana Smoothies. 15. Sauces that I consider necessities are: Bragg’s Amino Acids, soy sauce, tamari, and Worcestershire sauce. These all add a distinct and robust flavor to many recipes. When purchasing Worcestershire sauce, make sure to read the label and choose one without anchovies. It doesn’t have to be expensive and say VEGAN on it. My experience has been that some of the no-name, cheaper brands are anchovy-free. Creating new, healthy recipes with all my spices is like science and art brought together. Science, because of nutrition—using the power of foods to promote healing within the body. And art, because of beauty and uniqueness—capturing the visual appeal. Not to mention, it has to taste amazing. 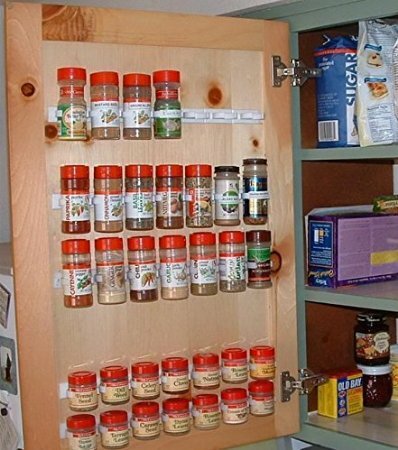 Having a full spice rack helps me do that! Spices can add so much flavor to foods. So glad that the list was helpful! Himalayan salt (aka black salt or pink salt) – has a sulfur kick which helps especially in flavoring tofu scrambles to taste a bit more like eggs, helps with some cheesy flavors too. Tony Chachere’s Cajun Spice – essentially a mix of cayenne, salt, garlic powder, and onion powder. I usually just use it as an after-cooking addition for a spicy kick to whatever I’m eating, as I have to make things milder for my wife and daughter than I like to eat them, but I also find that it can “fix” just about anything that doesn’t turn out the way I wanted it to. Thanks for sharing, Terri! I, too, would add a good curry powder to the list. I love the depth of flavor without the heat, in such dishes as tofu scrambles and especially in Morrocan-style veggie stew, one of my family’s staple dishes.